MANCHESTER, NH – September 18, 2012 – Velcro Companies, with its commitment to creating smart products, services and technologies wherever things can be connected, announced its partnership with Lundberg Family Farms. 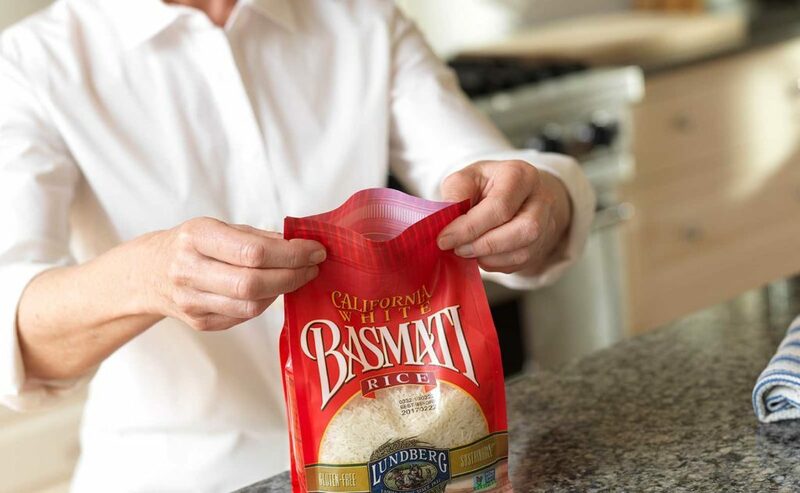 Velcro Industries is working with Lundberg Family Farms to integrate Velcro Industries’ new PRESS-LOK® closure technology into new package designs for their organic and Eco-Farmed rice lines to help ensure a more secure customer experience. Lundberg Family Farms is the first U.S. food company to use this technology in their packaging. Lundberg Family Farms worked with manufacturer, PEEL Plastics Products Ltd., a recognized leader in product and process innovation, to convert their existing lay-down packaging to a flat-bottom stand up pouch containing Velcro Companies’ PRESS-LOK® closure. Having the new rice package standing upright on the shelf will give Lundberg greater brand presence and consistency in shelf-sets that are already accommodating other grain brands in stand-up pouch packages, as well as deliver on the needs of the consumer. The VELCRO® Brand PRESS-LOK® closure system is a proprietary hook-to-hook technology. The closure is a unique solution in the industry because it contains an easy alignment that allows the hooks to engage without precise line-up, securing closure with great burst strength to maintain the package integrity. Consumers can find Lundberg’s new packaging at natural food stores and supermarkets nationwide beginning in the fall of 2012. Velcro Industries together comprise a technology-driven, global organization providing fastening solutions that solve problems in simple, elegant and surprising ways for businesses and consumers around the world. With more than 50 years of experience, Velcro Industries is proud of their heritage in innovation. Velcro Industries B.V. owns over 300 active patents and numerous trademarks, including the VELCRO® mark which is registered throughout the world. Velcro Industries offer global resources for world-class solutions, with manufacturing locations in Spain, the United States, Canada, Mexico, and China and sales offices around the world. “Like” VELCRO® Brand on Facebook: http://www.facebook.com/velcrobrand or visit www.velcro.com/business for more information. Since 1937, the Lundberg Family has been farming rice and producing rice products at their farms in the Sacramento Valley. Now led by its third generation, Lundberg Family Farms still uses organic and eco-positive farming practices to produce wholesome, healthful rice products while protecting and improving the environment for future generations. For more information, visit www.lundberg.com or follow us on Facebook, Pinterest and Twitter (@lundbergfarms). About PEEL Plastics Products Ltd.
For over 30 years, Peel Plastics Products Ltd. has been a recognized leader in flexible packaging solutions and process innovation. We create custom packaging solutions to complement your brand. As a responsive supply partner, our products are customized to provide solutions that are unique, industry relevant and brand specific. Peel is committed to being the most responsive supply partner, a recognized leader in product and process innovation, and the overall best value provider of flexible packaging materials. We house all of our print, lamination and converting capabilities in one location, which gives us a clear advantage at meeting otherwise challenging deadlines. For more information visit www.peelplastics.com and learn how we can help bring packaging innovation to your brand.